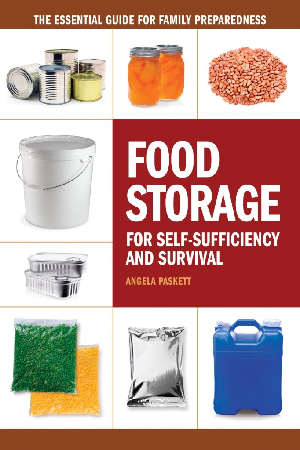 Angela Paskett owner of the blog Food Storage and Survival had asked me recently to review her new book called “Food Storage for Self-Sufficiency and Survival”. Angela’s basic intention is to teach you how to store the food that your family already loves to eat and to do it as easily and cheaply as possible. Does it live up to its claim? Angela reveals what types of food are best for your Bug-Out Bags (72-hour kits) with considerations for space and weight. She also keys in on the differing needs that children and infants have when planning your bug-out bags (this is something I see too little of in bug-out bag building lists or books). Although this is not a book that is concerned primarily with putting together an emergency kit, Angela does a good job at including just enough of the information that you need for using the food and water you’d be consuming while bugging out — such as various cooking methods, stoves, filters and so on. My favorite part of this chapter was definitely the “Homemade Survival Bars” recipe that can be made from long-term food-storage ingredients like oats, powdered milk, sugar, honey, gelatin and water. These are fantastic. All in all, it was a good chapter, however, because I respect Angela’s opinion, I would have loved to hear more about her personal opinions on what she packs in her kits and why. For those of you who are members of my Prepper Academy program, you may see a lot of similarities in her time frames for food storage preparations (2 weeks, 3 months, 1 year etc). I feel (as she must) that this is a natural way of organizing food storage based not only on food’s shelf life but also as a great way to separate your food storage goals into manageable milestones. In Chapter 2, Angela discusses the importance that short-term food storage plays in personal security and addresses the various methods of short-term food storage like the Menu Method and Inventory Method. She also includes some great tips for determining how much of a certain type of food you’ll need for a 3-month period. For example, a lot of beginning preppers have a hard time figuring out how much of a multi-use product (like ketchup, mayo etc) they use in a certain time period. The solution? Simply use a permanent marker to write the date the bottle (or whatever) was opened. Then when you’re done, record the end date. This time period is how long it takes for you to finish that particular product. So again, say if it takes you 2 months to finish a mayonnaise bottle, you’ll need 2 bottles to get through 3 months. In Chapter 3, you’ll learn what types of food you can store for Mid- to Long-term emergencies lasting up to a year or more. In addition, you’ll learn the shelf life of a variety of long-term storage foods, how much of it you may need as well as a few tips here and there on some ways you can use it. I would have liked to seen some more details into some different long-term storage plans and ideas in this chapter. Much of it is just a rehash of the standard long-term recommendations put out by the LDS church (Church of Jesus Christ of Latter-Day Saints). For example, it would have been nice to see some more recipes as well as some more detailed ways to use the “Mormon Four”. This chapter is all about the various methods for storing, purifying and filtering water. Angela does a great job at distilling (pun intended 😉 ) these methods down to an easily readable and understandable format including formulas for an array of chemical treatments. The biggest bang for your buck that you can get in food storage is in preserving your own. Learning to preserve can be a huge cost savings because you can take advantage of your own harvest or from grocers and markets when they are selling at a big discount. Angela covers the main methods of food preservation here such as canning, dehydrating, freezing and so on. Keep in mind, that although she gives basic instructions, this chapter is only an overview of the various methods available and shouldn’t replace buying books dedicated to the subjects. Overall though, it’s a great primer to getting to know more of what you may need to know (if that makes sense). I loved this chapter. I think Angela did a fantastic job at covering the best ways to store your bulk food for the long term. It covers using Mylar bags, plastic buckets, food sealers, oxygen absorbers, reusing containers, #10 can sealing and more. Very thorough and everything you’d need to get going in this important aspect of long-term food storage. This is another great chapter. Many people I come in contact with tell me that they can’t buy food storage because it’s just too expensive. I think that’s a cop out. It’s all about priorities. If you make it a priority you’ll find the way to come up with the money. Angela goes into a variety of ways to not only come up with the money for your food-storage investment but different ways of purchasing it (ie whether to get it in one lump sum or little by little) that’ll fit any budget. The best part of this chapter is her “Savings through Sacrifice” worksheet. Basically, the process is to make a list of things you voluntarily forgo or “sacrifice” with the intent of saving for food storage. For example, say one day I want to go out to dinner with my wife. Instead of doing that, we decide to sacrifice the meal and record on this sheet how much that meal would have cost. I then use that money (along with any other sacrifices we made) to purchasing food storage. Much of the disappointment I felt with chapter 3 was made up with this chapter. There’s some fantastic ideas in here about ways to improve your long-term stores of food using a variety of commercially purchased (or self-made) canned, dehydrated and dried foods so that you can have meats, vegetables, fruits, sprouts, dairy and more for the long haul. There’s also information on gluten free alternatives to the masses of bulk wheat that many of us have. Food storage is finite. Once it runs out that’s it. This chapter covers some of the other ways you may want to supplement your food stores (or entirely replace if possible when they run out). Obviously a ton of detail on these methods can’t be covered in one chapter (that’s not the intent of this book) but Angela does a great job at giving you the ideas and resources you need to delve deeper into these subjects. Topics covered are gardening, animal raising, hunting, trapping, and foraging are some of the topics covered in this chapter. *Note: If you haven’t yet seen my latest course on Survival Hunting be sure to check it out here. This chapter covers the where and how to organize and store your food. Also you’ll find tips on finding space (for those without much) and considerations on security. This chapter goes over the importance of proper rotation, gives you a sampling of recipe ideas, cooking methods, and food substitutions that show how to use your long-term food stores in day-to-day life. Also covered are ways of cooking when the grid is no longer up. I really think Angela did a fantastic job with this book. For someone just starting their food-storage journey — and even those who’ve been on the road for a bit — they will find this to be an excellent resource to get started and go back to time and again when putting up their food stores. It’s concise, easy to read, and not overwhelming — again, perfect if you need a thorough primer on food storage for survival. So does it live up to it’s claim as an “in-depth, nuts-and-bolts guide to storing food” that will teach you “a variety of food storage methods that you can customize to meet your family’s unique circumstances including family size, tastes, ages, health concerns, income, and living conditions”? Copies are available here at Amazon and all major booksellers. power, you can get a big close-up of a bad connection. shifting signals throughout these units. The best detail site I have found for dehydrating and storing food for the long haul is dehydrate2store.com Comprehensive videos for all kinds of food dehydration and how to use those foods to make wonderful meals. I learned how to turn delicious butternut squash into a powder when dehydrated that will fit at least four pounds of squash into a one quart jar that will store for many years as well as many othe great tips for food storage. Check it out.